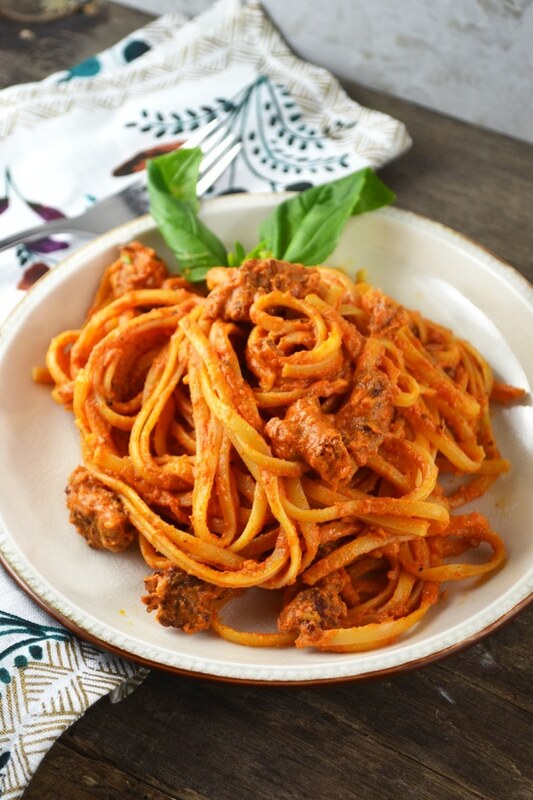 Make this creamy sausage linguine tonight, Italian sausage is mixed with a luscious and creamy tomato sauce and tossed through perfectly cooked linguine pasta. I hope you had a great weekend? I’ve been spending time with Nathan’s family, sightseeing in Siena, cooking yummy food and drinking good wine (any excuse eh). 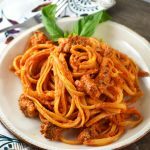 I wanted to share with you one of my favourite, easy and delicious pasta recipes, Creamy Sausage Linguine. It’s so quick to make that it’s a regular in our house through the week when I’ve maybe not got so much time on my hands or end up working late and need something fast. This always hits the spot. Why are Italian sausages THE BEST? I dunno about you but I love making dishes using Italian sausages such as my sausage and stracchino stuffed sweet mini peppers, sausage stuffed mushrooms with gorgonzola and walnuts and my Spicy chickpeas with herby sausages just to name a few. Yup, I have my fair share of Italian sausage recipes on the blog but really, can there ever be too many? Definitely not. 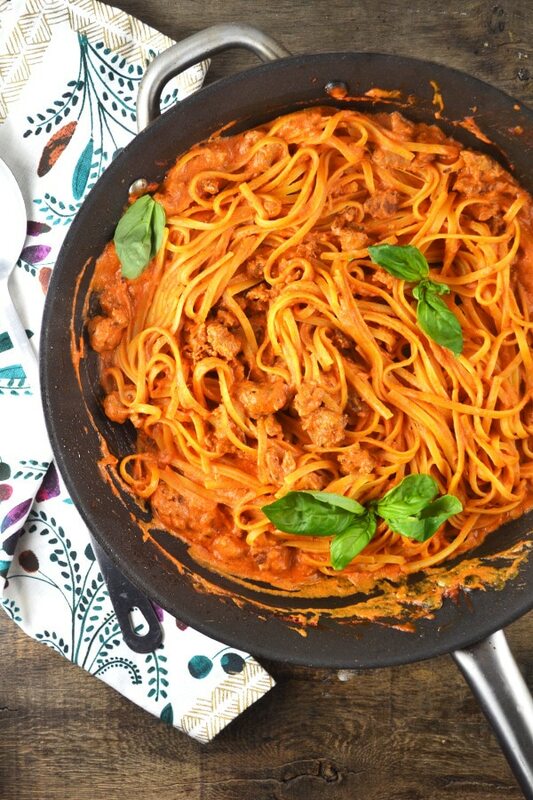 This creamy sausage linguine is pure comfort food, here’s how I make it. Firstly I brown the sausage in a frying pan with some garlic and oregano. I add some passata (pureed tomatoes) along with a good pinch of pepper. Italian sausages already have enough seasoning in them to flavour the whole dish so there’s no need to add salt, however always check in case it could do with a pinch. At this point I add the linguine to a pot of salted boiling water and take the sauce off the heat. I always add sour cream into sauces by taking it off the heat first. It helps keep the sauce glossy and luscious without going grainy. Then I mix the sour cream into the tomato, sausage sauce and place it back on a low heat until the linguine is cooked. 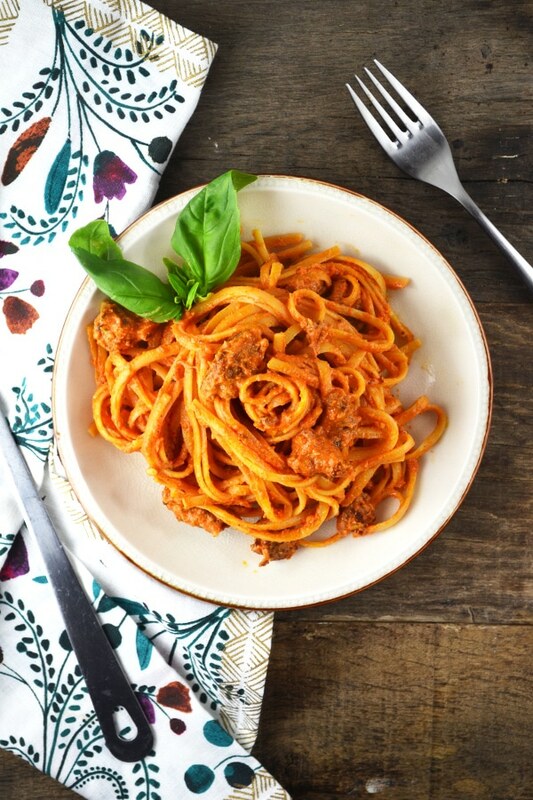 The linguine is then tossed through the sauce (ALWAYS add the pasta to the sauce and NEVER add the sauce on top of the pasta, just no no no) until it’s thoroughly coated. Finish with some basil leaves and serve. This gorgeous, mouth-watering dish is ready to be devoured and become you new favourite comfort food! Bring a large pot of salted water to the boil. Add 1/2 tsp of olive oil to a large frying pan and brown the sausage meat. Add the garlic and oregano and fry for 30 seconds. Add the passata and a good pinch of pepper and reduce the sauce for 5 minutes. Add the linguine to the boiling water and cook according to packet instructions. Turn the sauce off the heat and add the sour cream. Stir to combine the sour cream into the tomato, sausage sauce. Place it back on a low heat (check for seasoning) until the linguine is ready. 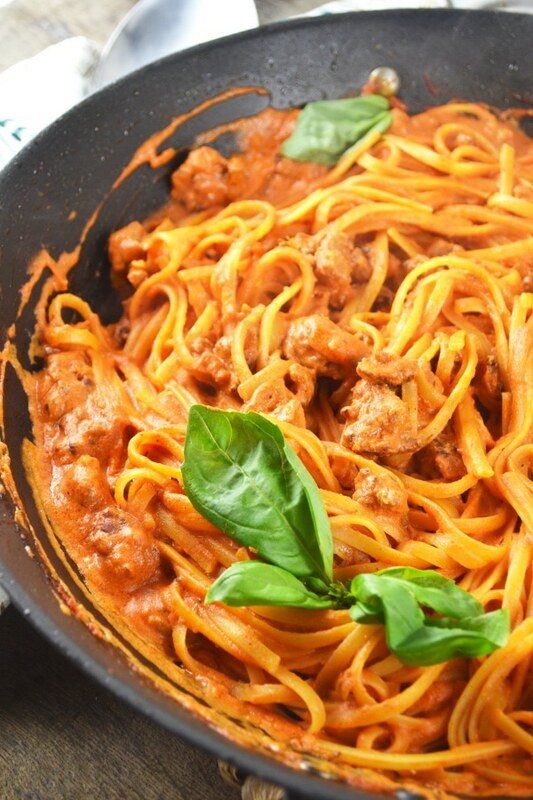 Toss the linguine in the sauce and serve with some basil leaves. This was so delicious, loved it.